Start your mornings with the smoothest, creamiest smoothie bowl you’ll ever taste – this luscious Pumpkin Smoothie Bowl has become a favorite of mine this week! Coffee has always been my breakfast of choice – I know, not the healthiest. But during the season that I work at the restaurant (between May and October), I’d rather sleep those extra fifteen minutes than eat a nourishing breakfast (sorry Ma!). Now that I have more time during the off-season, I’m testing out new breakfast ideas – like this Pumpkin Smoothie Bowl. The granola is enriched with pumpkin and flax seeds to offer up an impressive 450 mg of Omega-3 fatty acids and 1500 mg of Omega-6 fatty acids! The superfood is made with Chia, Hemp and Buckwheat. This power trio is full of plant-based Protein, Fiber and ALA Omegas. If you’ve never given a smoothie bowl a try, you might be wondering – “why make a bowl when I can just slurp a smoothie?”. Well, my friends – because this is WAY thicker than a smoothie, having to consume it with a spoon and honestly tastes like ice cream. And who doesn’t want to wake up to ice cream in the morning. Healthy ice cream, that is – packed with protein from the Stonyfield yogurt, antioxidants from the pumpkin puree, and the natural sweetness of bananas, this smoothie bowl will make you want to turn everything into a bowl! 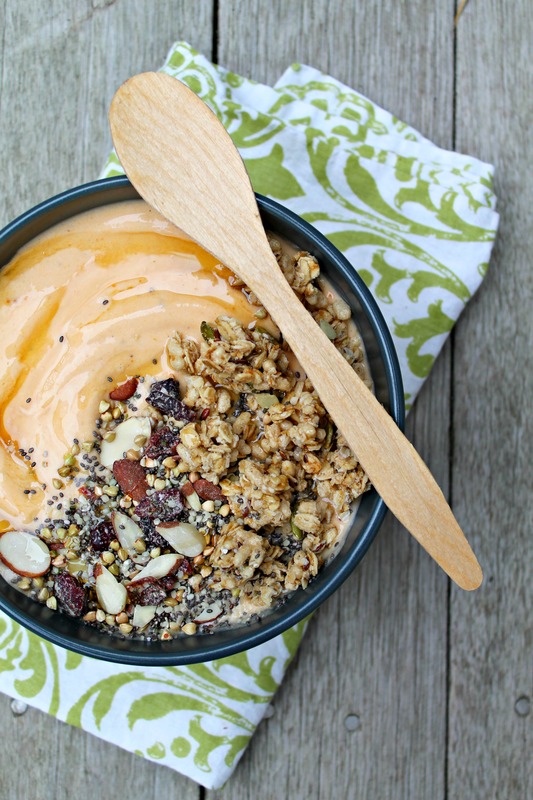 Dive into a big bowl of this pumpkin smoothie bowl topped with even tastier granola and superfood mix! In your food processor, blend the bananas until crumbly. Add the pumpkin puree and yogurt; pulse until smooth. Pour into two bowls and top with granola, superfood mix, and maple syrup. Serve immediately. Disclaimer: This is a sponsored post – opinions are 100% my own, as is my love for Stonyfield and the healthy brands they help me partner with, such as Nature’s Path! Absolutely beautiful bowl, Marnely! Makes me wish I had some Pumpkin Granola right now.